Last week Sam asked for some more shooting information. So, before I discuss today’s photo, I will give you a few more details. First, I have shot at this location a couple times, but never got anything that I really liked. I had decided that I wanted to visit it when there was fog, as I did over the holidays. Second, I spent about an hour and half shooting and took about 230 photos (including several bracketed exposures for possible HDR). Today, I have only 12 images from the session on my hard drive. Of the remaining images, there are about six that I feel may be worthy of showing and another six that for some reason, I like—ones similar to the second image I presented on Friday. Now, about today’s image. When I looked at this scene, I really did not see boats, piers, water and fog; I saw geometric shapes. And, that is what I wanted this photo to show. I felt that a sepia toned photo helped simplify it so that the shapes showed-off better. What do you think? Camera settings: Nikon D3, Nikon 28-70mm f/2.8 at 34mm shot at ISO 200, f/11 and 1/125th of a second. Photoshop—used nik Silver Efex Pro to convert to sepia toned image. I think the idea is good. I question whether removing the color and using sepia in this case actually takes away some leading lines of reference. I'll have to look at it a few more times before I figure out the full impact. I like the sepia toning. 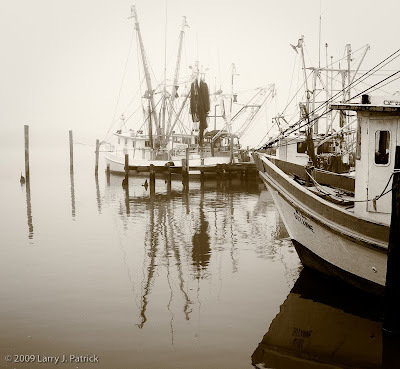 It provides a feeling of timeliness to the photo, which is one of the things that I think about when I see shrimp boats. I can see lots of triangles in the photo, but I do not think that is the first thing that I would see if I looked at this scene. My list favorite of your shrimp boat photos. Not sure I see the main subject or the point. Sepia toning is distracting. I cannot see the geometric shapes but I like the photo. Reminds me of home. Not sure I see what you were trying to show me. Also, not sure what the subject of the photo is. Like the photo but cannot see what you are talking about. I'm with the others though about not necessarily seeing the geometric shapes you want me to see (if I understand you correctly). The problem is that there is nothing abstract about the shot so I don't just see shapes or patterns; I see a very literal scene with sky, fog, water and boats. Does that make sense? Anyway, like I said, beautiful shot! I agree with Barry. The photo is too literal to push me in the direction that you seem to have gone. To me, this is a very controlled composition of boats in the fog which you have treated with a nice sepia toning to give it a more ageless quality. I find this photo to be intriguing because the item that is most in focus, the boat in the foreground, is a very small part of the photograph and is generally not the more noteworthy aspect of the photo. Larry, must admit, I do not see the geometric shapes. I like the sepia toning. What I like about this photo is that you have a very detailed part of the photo and then some not so detailed parts albeit fog or DOP. Very nice and pleasant to look at. You should do a series on the fog, Larry, you have an eye for it. Like most I do not see the shapes. But, also like most, I like the photograph. I like how controlled all the elements appear.